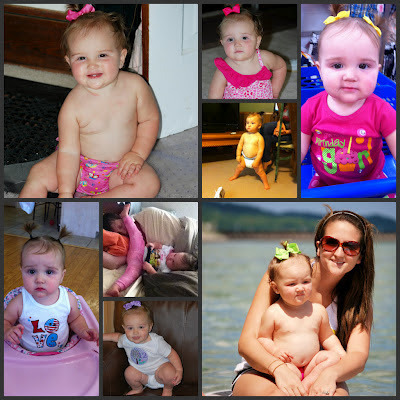 Presley is twelve months old! One year. 365 days. 52 weeks. We made it! After not seeing the doctor since April (I think), we finally had a check up today! 23.5 pounds. She sure does feel heavier to me though! 30 inches. Why does it seem so much more normal to say "30 inches" rather than "2 1/2 feet" tall. I don't think she can wear anything 12 month anymore. It's basically all 18 months. Some 18-24 months, just depends on the brand! Presley was 1 for about 5 minutes when I decided we were cutting out formula and bottles- cold turkey. I don't prefer to slowly transition because I'm impatient. We give her Silk (original) milk. In the morning time we add about 1/2 of a Nestlé Carnation Breakfast (Vanilla), then the rest of the day it's just plain milk, apple juice, or water! She is also eating oatmeal, eggs, toast, or pancakes for breakfast. Snacks are usually goldfish, yogurt melts, crackers, cheese. Lunch and dinner varies she likes macaroni and cheese, Chicken & Stars, rice and veggies, noodles, really just whatever! Same ol stuff as last month. I can honestly say I am so glad to be able to go out to eat and not have to worry about taking baby food! Lots of hair now! Sometimes it's curly and sometimes it's not! Eyes are still green! She goes to bed between 7:30-8:00 and sleeps until 7:00. Sometimes she takes a morning nap around 9:30 and then another one around 2:00! The last few days though she's only had one nap, lasting 3 hours! I seriously didn't know what to do with myself. I went in her room TWICE to wake her up because I was bored. I've officially lost all my marbles. Can say Mama, Dada, Gaga, Papa, bye bye, dog(and will bark), uh-huh, and Rah Rah (my aunt), cat, meow, cheese, bambam. She has been such a hugger lately! It's so sweet! She will come up to me, put her head on my shoulder, and pat my back! I die. Now when she blows kisses she says,"mmmmmMA"! Presh. When she knows she's getting into something she's not supposed to, she will TOTALLY ignore you when you get onto her. I predict lots of trouble in our future. We've also hit a HUGE separation anxiety phase. The last two Sundays I've been paged at church to come get her. And don't even THINK about touching her. She will give you the stink-eye like it's her job.